For fastest shipping and the most economical price, our stock sizes are the way to go. But if our stock sizes won't fit your situation, use this page to order exactly the sizes you need. Custom sizes cost more per square foot than our stock size panels, but note that 48x48" (4 by 4 feet) and 48x96" (4 by 8 feet) sizes have special discounted custom size prices. Because of this a 48x96" panel will cost less than a 48x95" panel, for example. Featuring a hardened edge construction without an internal frame. Multiple mounting methods allow for project specific mounting options. Attractive, textured cover fabrics are available in a range of stock and custom colors and types to match your style. Original fabric is a 100% Jute Burlap imported from India. Guilford of Maine fabric is a 100% polyester blend manufactured exclusively in the United States by Guilford of Maine for ATS Acoustics. Quick easy shipping to anywhere in the US via UPS. 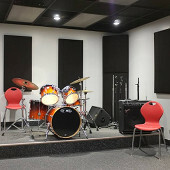 ATS Hardened Edge Acoustic panels may be installed utilizing various methods. Impaling clips can be used in conjunction with construction adhesive(sold separately) to hold panels in place while the adhesives cures--ensuring a more permanent installation solution. For a permanent to semi-permanent solution, Rotofast anchors or Z-clip hardware can be attached to the walls and panel to hold panels securely in place. Rotofast anchors are a two part solution. With one part attaching to the wall, and the second part screwing into the panel, the two part anchor is snapped together to ensure a tight hold. Please note that they do snap together tightly and can be difficult to separate. Z-clip or Z-bar hardware (depending on the panel size) can be used for a more semi-permanent solution. Aluminum clips are pre-attached to the panel at select locations. Secondary clips, screws, and conical anchors are sent with your order for a neat and secure sliding attachment on drywall, concrete, or wood walls. For hardened-edge panels, fire rating is not available with burlap fabrics. If you need fire rated panels, please choose Guilford of Maine fabric. Current Shipping Time: We are currently experiencing high order volume and unusually long lead times. The current expected lead time to ship is 2 to 4 Weeks. We recommend customers order promptly to reserve their place within the production queue. If your order is time sensitive or must be received by a specific date, please contact a sales representative to discuss your order and possible options. We are working hard to catch up and thank you for your patience. Panels in all color choices are ASTM E84 Class A fire rated. Choose from one of the available installation hardware options. Construction adhesive is required for the impaling clip hardware option, but it is not included. Impaling clips and attached Z-Clips are not suitable for ceiling applications. Select Rotofast Snap-On Anchors for flush-mount ceiling applications, or select Rotofast Cloud Anchors for suspended panel ceiling applications. Please consult a sales representative for any questions regarding these mounting options. This helps us attach your installation hardware in the correct orientation. If you are not selecting attached z-clip hardware, you may select Not Applicable here, or still choose to indicate the install orientation for your future reference. For installations at a custom angle (something other than plumb and level edges) select Custom Angle and plan to provide a sketch with angle specifications. Enter decimals (30.5) not fractions (30 1/2). Max. dimensions 48 x 96. Final dimensions may vary up to 1/4". Please allow adequate clearance if fitting panels into tight spaces. Due to panel weight, it is not suggested to use 4 inch thick panels for ceiling applications. High-Impact panels have a 1/8-inch thick surface layer of denser fiberglass below the fabric. This produces harder corners and better impact resistance across the surface of the panel. This layer also makes the panel surface tackable, as the denser layer holds push-pins well. This option adds 1/8" thickness and an additional charge.